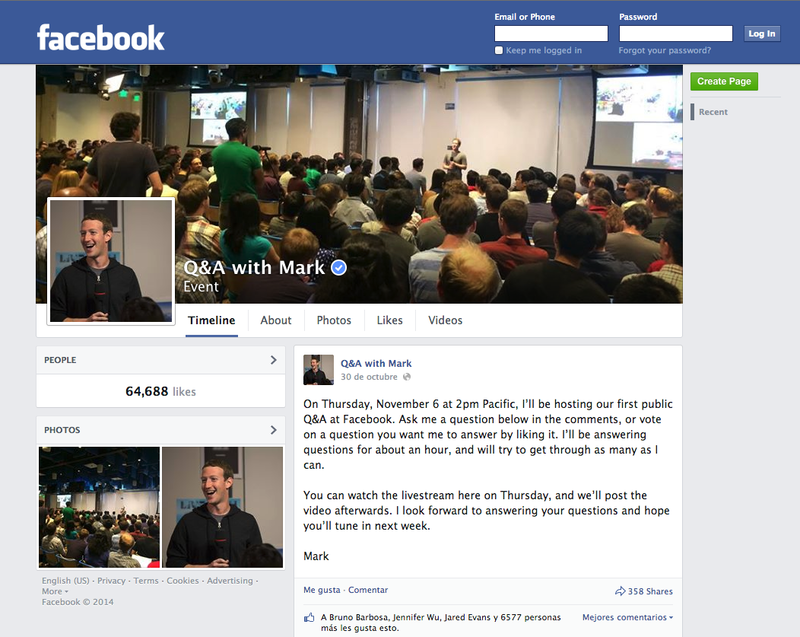 You probably have read about Mark Zuckerberg’s live Q&A session published in Facebook. Our mission to give people the power to experience anything. Even if you don’t have the ability to travel somewhere, or to be with someone in person, or even if something is physically impossible to build in our analog world, the goal is to help build a medium that will give you the ability to do all of these things you might not otherwise be able to do. This will be incredibly powerful as a communication medium, as well. Just like we capture photos and videos today and then share them on the Internet to let others experience them, too, we’ll be able to capture whole 3-D scenes and create new environments and then share those with people as well. It will be pretty wild. What’s your opinion on the net-neutrality implications of Internet.org providing free access to only a select few “basic Internet services” in the developing world, while other services require a data plan, and how Facebook/Internet.org is in the position to choose what services are free? I think net neutrality is important to make sure network operators don’t discriminate and limit access to services people want to use, especially in countries where most people are online. For people who are not on the Internet, though, having some connectivity and some ability to share is always much better than having no ability to connect and share at all. That’s why programs like Internet.org are important and can coexist with net-neutrality regulations. Thanks for stopping by, Richard Branson! When we talk about connecting the world, most people talk about the clear benefits to all of the people who will get Internet access and don’t have it today. Those benefits are many: access to education, health information, jobs and so on. Many people estimate that for every billion people we connect, we’ll raise more than 100 million out of poverty. Think about how many brilliant entrepreneurs there are out there who have great ideas and the will to change the world, but just lack basic tools to do so today. If you go by the population, almost two-thirds of these entrepreneurs don’t have Internet access today. Once they get connected, we may have three times as many good ideas and amazing new services built that will benefit everyone around the world. Thanks for the question, Shakira! I’m very excited about personalized learning — giving everyone the ability to use technology to learn what they’re most interested in and at their own pace. There are some great new schools experimenting with different personalized learning models and getting great results. I’m supporting some of those schools through my personal philanthropy, and Facebook is also helping to build open-source software to power some of these tools. That depends on what you count as work. I spend most of my time thinking about how to connect the world and serve our community better, but a lot of that time isn’t in our office or meeting with people or doing what you’d call real work. I take a lot of time just to read and think about things by myself. If you count the time I’m in the office, it’s probably no more than 50 to 60 hours per week. But if you count all the time I’m focused on our mission, that’s basically my whole life. Readers: What would you like to have asked Zuckerberg? This entry was posted in Dilmot and tagged Facebook, Live Q&A, Mark Zuckerberg, Technology on April 22, 2015 by admin. We have seen in in previous occasions, Facebook offers Q&A sessions with celebrities. This time, the 6th of november. You know Dilmot.com (and if you didn’t, now it’s the time to tell you offers you the functionality of integrating a live Q&A within Facebook. Read more about it here: How to make a Q&A session in Facebook? 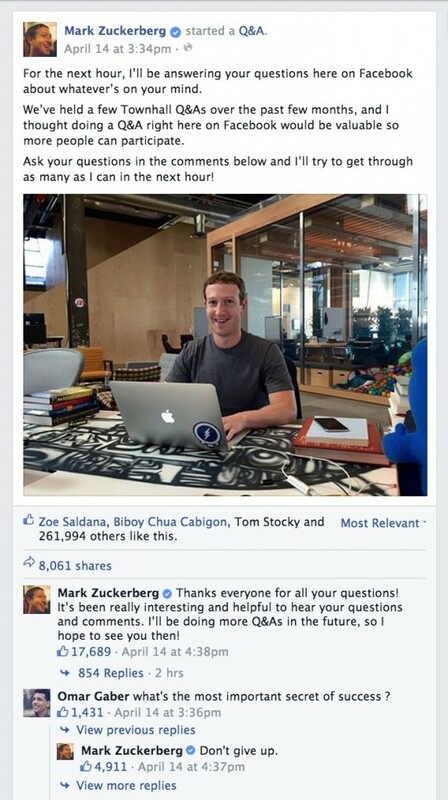 This entry was posted in Dilmot and tagged Dilmot, Facebook, Mark Zuckerberg, Q&A on November 1, 2014 by admin.